Goerlich Quadruplets: St. Patty's Day Green? We've been seing a lot of green around here lately, though we weren't voluntarily wearing it and it certainly wasn't from too much celebrating. A stomach virus hit our house and spread like wildfire. 3 Down For the Count! It was halfway through the epidemic that I realized it was time to have an official Goerlich throw-up bowl. We all know the bowl we had growing up - the one your parents would make you carry around with you in hopes for easier clean-up. Thinking back, I remember that big orange tupperware bowl vividly. The disturbing thing is I remember it as the popcorn bowl as well. Anyway, here's a quick video of our throw-up bowl bootcamp. The Bowl from Mari Goerlich on Vimeo. I just stumbled upon your blog and I love the throwup bowl bootcamp. I am so sorry they are sick. My oldest (4) had it and she didn't quite get the bowl until she was sick. Then she understood what it was for. I hope for your sake they catch on soon. Laughing as I think you're teaching them it is the popcorn bowl as well. We use one of those pink washbasins you get at the hospital as our throw up bowl. Same thing my parents used with us. We, however, don't use it for anything else. But all the kids know where to go and find it when it is needed. It is for this very reason that I DO NOT eat salad at my sister's house, or anything for that matter out of "THE GREEN BOWL" I have been at her house and seen THE BOWL used for ick and then at Thanksgiving used for salad. "It went through the dishwasher" she says. No thanx sis. 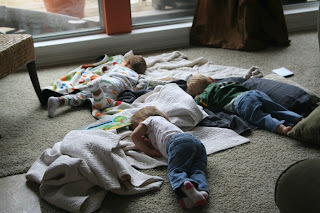 Ahh, so sorry-I have enough trouble dealing with me when I'm sick-and one K student throwing up is enough to make me leave the room-so I can't imagine three all at once. But the video gave me the giggles, and I hope everyone feels better and is up to fun and play soon! Love you and miss you. Crackin me up!!! HN has a bucket a/k/a her Easter Basket!! Now I have ensured noone will invite her over for Easter Egg Hunting!! This goes down as one of the cutest posts ever!!! Hope the stomach bug is gone soon!!! Awww, poor babies (and mama)! Lovin' the throw-up bowl bootcamp...hope it's a success. Get better little Goerlich leprechauns! Aww, how cute, but sad it is when little ones are sick! Loooove the bowl boot camp! Did any of them make it into the bowl? nooooooooo!!!! it is SO hard having sick quaddies! hang in there, mare! what a cute video---and they look SOOOO grown up all of a sudden!!! poor sweet thangs. wow. There are sure amazing little tykes! We just had a trash can not a bowl. Poor sweeties. I hope you are all well soon. We love you,Chris, babies and the Jaz to pieces. Oh Mar, I DO hope today was a NEW DAY! Another day that I wish we could be just down the block from each other. I'm praying for all of you! HAHA! Love the video! Growing up, we had a throw up bowl too and guess what...it was also our popcorn bowl! What were our parents thinking!!! Hah! When I was a kid, our throw up bowl was a huge green Tupperware bowl that was also used for popcorn! Just so no one has to experience the throw up bowl also serving duty as the popcorn bowl, we used a plastic trash can (w/ a liner) as the alternate to the throw up bowl. Just throw the liner away after use. Hope they are all throw up free and better :) It is no fun being sick. Miss Sophia touched my heart since she just was not feeling so hot...hang in there! delurking to say that this is my favorite blogpost of any blog ever. hahahaha. hope they are feeling better soon. Ughhh, no bueno!! I hope they are feeling better and nice work guys on the bowl!! Love you! !